A detailed plan to coordinate the building of 1,400 new homes on land east of Kenilworth is expected to be commissioned by Warwick District Council. The houses will be built on the land by 2029 as part of the council’s Local Plan, which is set to be adopted on Wednesday September 20 after being approved by a government planning inspector. The first site near Thickthorn Island will have 760 houses and a primary school, and the second site off Crewe Lane will include 640 houses and a new setting for Kenilworth School and Sixth Form. Eight hectares of land for employment has also been set aside. Warwick District Council wishes to create a detailed ‘development brief’ for the area to make sure all future building in the area is coordinated. 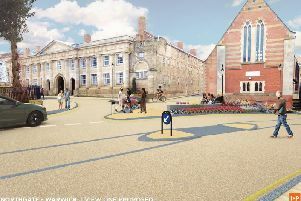 The brief would cover issues such as where key roads, pedestrian routes and cycle lanes are likely to be, how to incorporate the new schools into the area, how to link the area to the other parts of the town, and how to reduce flood risks. Creating the brief is expected to cost around £30,000. Cllr Alan Rhead, portfolio holder for development, said: “There are some real opportunities and complex issues associated with the development of this area and I am keen that we work proactively to put the right framework in place. How the brief will look will be strongly influenced by the Kenilworth Neighbourhood Plan, the final version of which is being drafted. Part of the Neighbourhood Plan says any proposals for building on the land will only be supported if a ‘comprehensive masterplan’ is created, which adheres to several principles such as the creation of a green corridor between the northern and southern sites, and roads that allow both sites to be accessed easily. The future development of the land generated debate at a public meeting on the Neighbourhood Plan on Tuesday July 25. A concept ‘spine road’ in the plan from Leamington Road to Birches Lane as part of the development was criticised. But Ben Simm of Warwickshire County Council said it was ‘down to the developers’ as to what the spine road could look like. However, councillors may decide not to create a brief to save money, and instead allow developers to create their own version. In their report, district council officers warned the time needed to create a good brief could stop the planned houses and schools being built quickly. They also warned the council would need to be ‘pragmatic’ to make sure everything was built on time if disagreements between interested groups led to problems. The district council’s executive will vote on whether to create the development brief on Thursday August 31.